This summer, Bodhi Surf School and the community of Bahia Ballena, Costa Rica hosted four groups of high school students who came down to participate in the “Protecting the Pacific” program through the travel company, Global Leadership Adventures (GLA). All four groups were in the community for 12 days each and participated in a number of activities, including surfing, zip-lining, whale watching, kayaking, and doing 30 hours of community service work. They also took part in a number of seminars on subjects ranging from coastal development to sustainable business to ocean awareness and marine conservation. GLA is a high school travel company based in San Diego, California, whose website describes themselves as providing a “new approach to service-learning abroad for intellectually-curious and socially-oriented teenagers”. GLA is actually a division of Terra Education, an international service-learning provider that, along with the National Peace Corps Association, operates Discover Corps. GLA’s programs are designed to impart life-changing experiences that will ultimately help these young people become globally aware citizens and leaders who will go on to affect positive change in their own communities. GLA’s has programs operating in 12 countries around the world, with different focuses which include: children’s issues, environment & ecology, sports, poverty alleviation, public health, traditional culture, animals & wildlife, language learning, and leadership activities. The service project theme of this summer was creating Biogardens and other water filtration systems to help tackle the community’s greywater issue. In rural areas of Costa Rica, much of the “greywater” — that which is used by washing machines, showers, and sinks — doesn’t get treated along with “blackwater” or sewage. It’s not uncommon for greywater, along with the germs and bacteria as well as soaps and other chemicals in that water, to simply run off and join creeks or rivers that end up in the ocean. Since Bahia Ballena borders the Marino Ballena National Park (a place that teems with marine animals such as whales, dolphins, sea turtles, and fish to name a few), and the park is what many in the community depend on for their livelihood, it’s an especially important issue for us. Building a Biogarden at Escuela Uvita, one of the local primary schools. Before the Biogarden was in place, the kitchen water, which contains oil, food, and soap, was draining right where the kids play — to one side of the soccer field. The Biogarden now filters that water and provides an aesthetically pleasing garden on the school grounds. Building four drainage systems for some of the showers and sinks in Marino Ballena National Park. This project was especially important as these showers and sinks are located mere footsteps away from the ocean. 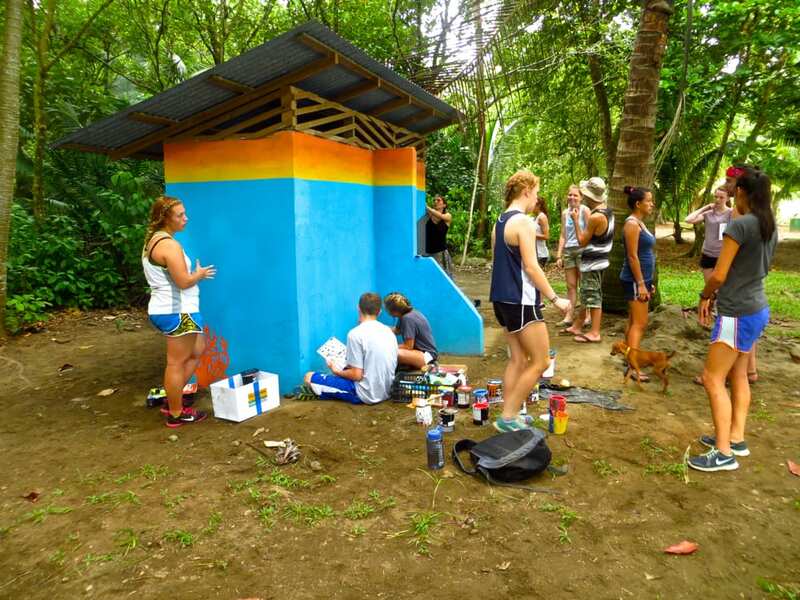 Painting and beautifying several of the park’s showers, sinks, and bathrooms: making them visible, bright, and beautiful. Creating a series of signs with positive environmental and leadership messages for around the community. Helping make typical Costa Rican rugs using recycled fabric for the kids at the local youth group, Forjando Alas. The 2014 Protecting the Pacific programs were a great success. Over the course of the summer, nearly 100 students stayed here and were able to become immersed in the culture of a small, coastal Costa Rican town and get acquainted with this lush, green, tropical environment: one of the world’s most biodiverse areas. We hope that the experience of doing service and marine-based activities was an enriching and pivotal experience for these young people. Cultural immersion at its finest — fútbol! On behalf of the communities of Bahia Ballena — Uvita, we are so grateful for all of the hard work that these students contributed. It will make a positive difference for the environment and the livelihood of these town and its residents.